I would see pictures of this bouncy, curly haired girl. I had no clue who she was. 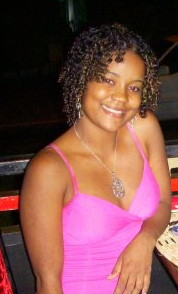 Then she introduced herself to me in Pulse Nightclub, when I was last in St.Lucia. Her name is Olivia. By the end of our very first conversation, my daughter and I were invited to Olivia's daughter's first birthday party. Yes, Ava-Sol had a fun time but I was left tired from all the excitement of the party! Today, Olivia emails me information about her first single, "Hey guys! I think most of you have heard the song already ... but in case you havent here it is! Tell me what u think ... I'm very open to constructive criticism. LOVE YA'LL!" Thanks for the update, I like this song Olivia!